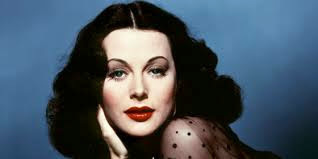 Austrian actress Hedy Lamarr is one of the least remembered of the classic Hollywood beauty queens, but for moviegoers in the 1930s and 1940s her name conjured up visions of exotic glamour and mystery. The 100th, or possibly *101st, anniversary of Lamarr's birth will be this Sunday. In this article, I will look at her film career and also celebrate her important contributions to science and technology. *Note: There is some discrepancy over Lamarr's actual birth year. Her son and her biographer put it at 1914, while other sources, such as the Encyclopedia Britannica, have it at 1913. There's more here, if you're interested. Whatever the year, Lamarr was born Hedwig Eva Maria Kiesler on Nov. 9 in Vienna to a prominent banking family. German impresario Max Reinhardt gave Lamarr her start in films when she was only a teenager. Lamarr worked her way up from bit player and script girl and in 1933 she became an international sensation when she appeared in the Czech film, Extase. After a brief marriage, Lamarr was discovered in 1937 by MGM chief Louis B. Mayer, who gave her a new last name in honor of silent film actress Barbara La Marr. 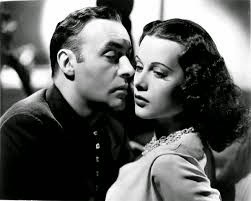 Lamarr's first Hollywood film, Algiers, was a huge hit. Lamarr worked steadily for the next decade, but she was only ever an average actress. Her breathtaking beauty and exotic allure led producers to cast her as the femme fatale, but she was rarely asked to do more than look ravishing. She was the first choice to play Ilsa in Casablanca, but either she turned the role down or MGM executives would not let her out of her contract (stories differ on this matter). 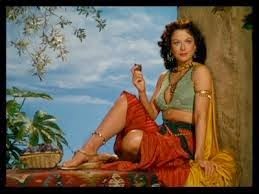 Delilah (Hedy Lamarr) waits for her first glimpse of Samson in Cecil B. DeMille's 1949 Biblical epic. Her career declined after Samson and Delilah in 1949. She sometimes appeared on television, but in the next decades she led a mostly quiet life. She did briefly resurface in pop culture in 1974 when Harvey Korman played conniving lawyer Hedley Lamarr in the Western spoof, Blazing Saddles (Lamarr filed a lawsuit against Mel Brooks and it was settled out of court). Lamarr died of heart disease in 2000. Her ashes were spread in the Vienna Woods at her request. 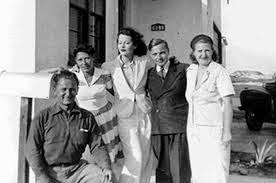 Hedy Lamarr (center) and George Antheil (to her right) patented spread spectrum technology in 1942. Lamarr's lasting legacy will be her career as an inventor. Lamarr was always exceptionally talented in mathematics and while she was a movie star she enjoyed going into her "invention room" to get away from the stress of Hollywood. Lamarr's most important invention is "spread spectrum" or "force-hopping" technology which she patented in 1942 with her Hollywood neighbor, composer George Antheil. The technology manipulates radio signals at irregular intervals so they form an unbreakable code. Lamarr and Antheil's idea was to help radio-guided torpedoes reach their target during World War II, but the U.S. Navy did not adopt the technology until 1962. Lamarr and Antheil's invention helped fuel the digital boom making cell phones and wireless technology. Next week will look at Lamarr's first Hollywood hit, Algiers.